The World Congress of Families takes place from March 29-31 and gathers anti-LGBT, right-wing politicians and anti-abortion organisations. The draft law was put forward by Stefano Stefani, a leading figure in the right-wing populist League party, which is currently governing in a coalition with the Five Star Movement (MS5). 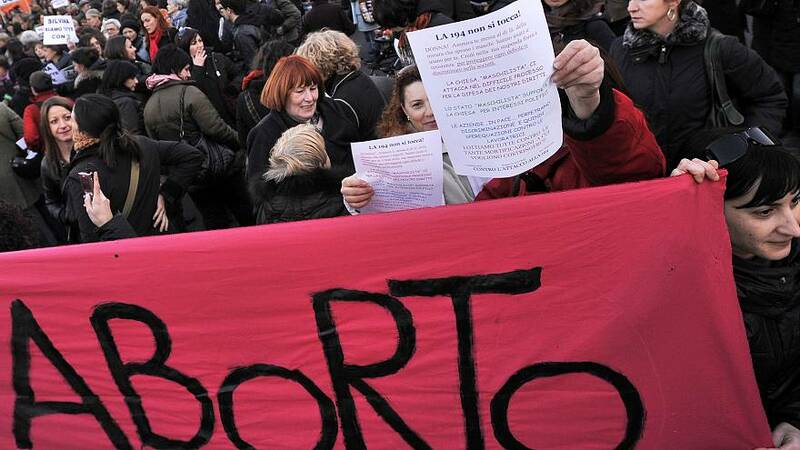 READ MORE: Abortion is legal in Italy — so why are women being refused? READ MORE: Which European countries have the strictest abortion rules? It denounces the "social and cultural effects" produced by Law 194 — the law legalising abortion that was signed in 1978 — as well as "the increasing use of abortion as a contraceptive tool", the "hidden killings produced by abortion pills" and "pressures from ideological groups" in favour of abortion. These, the proposal argues, are to blame for "the emergence of the current demographic crisis". Its stated purpose is to "identify the most effective ways, in terms of political choices, to prevent abortion as the primary objective of public health choices as well as to match the high number of "unwanted" pregnancies to the real desire of couples" seeking to adopt. Stefani defended the measure in the Corriere newspaper, stating that "the freedom of women to abort is not affected" by his proposal. But it was denounced by the centre-left Democratic Party (PD), which said it would pit women's rights against those of unborn children. PD Senator Monica Cirinna called it "a clear attack on the freedom of self-determination of women and to Law 194," while MP Elena Carnevali highlighted that "the possibility of giving birth anonymously" in order to give up the child for adoption already exists in Italy. "Perhaps, we should make it more known," she suggested. Prominent members of MS5, including Deputy Prime Minister Luigi Di Maio and Justice Minister Alfonso Bonafede, also came out against it. Maria Edera Spadoni, an MS5 MP and vice-president of the Chamber of Deputies, said in an interview with Corriere Della Sera that "my opinion is that 194 will be indirectly modified" by the proposal. She described as "all lies" the argument that abortion is to blame for demographics changes and said that solutions including increased benefits for families and lengthier paternity leave would be more effective to boost natality. "The League's proposal does not deal with all this," she deplored. However, the children's rights group, Friends of Children (Ai.Bi) which is accredited by the Italian state for intercountry adoption, supports the measure. "We have been trying for years to introduce a law that recognises the right of life of children and the adoption of the unborn child (adoption in the belly) as a means of preventing abortion," Marco Griffini, Ai.Bi's president, said in a statement. It also received the backing of Alberto Gambino, a jurist and vice-rector of the European University of Rome who told the ANSA news agency that "it does not aim to replace the possibility of abortion with that of adoption at birth, but to expand the freedom of choice of the woman who has an extra alternative." The League's proposal is the latest to spark condemnation by women's rights and pro-choice groups. The party also introduced a bill last November to reform divorce laws, known as the Pillon bill, which would require every couple with a minor child seeking to divorce to go through a mediation process that they'd have to pay for themselves. It also seeks to impose shared custody and do away with monthly child support. Its main backer, Simone Pillon, said the bill aims to crack down on false accusations of domestic violence and "the serious phenomenon of parental alienation" but critics fear it could be exploited by violent partners and leave women and children more vulnerable. League Senator Maurizio Gasparri also introduced Bill 950 which seeks to give children legal rights from the moment of conception instead of from birth. Matteo Salvini, leader of the League party and Italy's interior minister, has been criticised for his planned appearance at this weekend's congress in Verona. According to the US-based Southern Poverty Law Centre, the event aims "to ensure the continued political and cultural marginalisation of LGBTQ people and to work to limit access to reproductive healthcare. Some of the speakers have spoken in favour of harsh punishments —up to the death penalty — for gay people.